Touching Darkness by Scott Westerfeld is the second book in the Midnighters series. 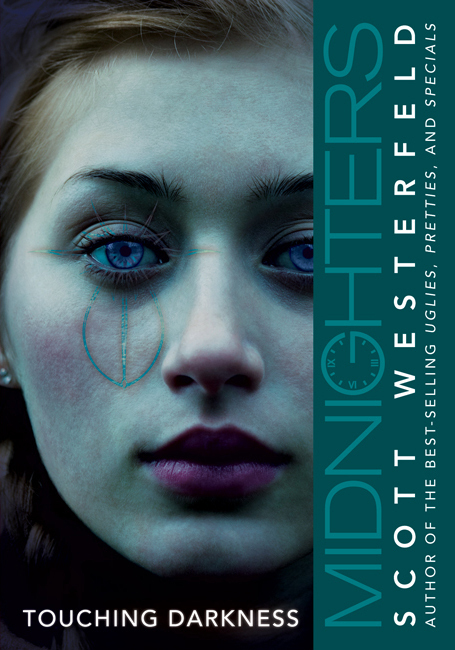 As with all series by Westerfeld, you will be completely lost if you read the books out of order, so I highly recommend reading Midnighters: The Secret Hour before tackling this one. In the first book, Jessica finally found out what her power was as flame-bringer, but the darklings are unwilling to give up that easily. They need a way to communicate with the humans that are willing to sacrifice other humans for some of the power the darklings can give them. The human on the darklings’ list right now is Rex. As a seer, his abilities could be a link between the Midnight Hour and the other twenty-four hours of the day. What will they do to save Rex? I really loved this book and ate it up in a day or so. Unlike most Westerfeld books, however, I wasn’t able to glean any good quotes from this book. That either means that there were no good quotes in the book, or (more likely) I was so into the storyline that I forgot to look for quotes. If any of you Midnighters fans out there find good quotes from this book, post them here on the comments and I’ll add the best ones to the collection!